The Thermablate Endometrial Ablation System is a clinically proven, gentle, two minute treatment that can significantly reduce or stop heavy menstrual periods for women who have completed childbearing. 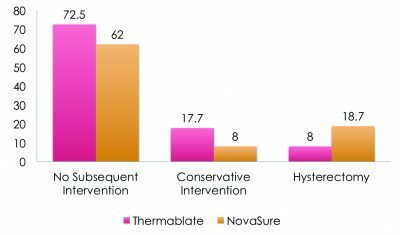 Thermablate EAS is a one-time, non-hormonal treatment that reduces the need for major surgical intervention such as hysterectomy. The Thermablate EAS is made up of a Treatment Control Unit (TCU) and disposable cartridge, often referred to as a balloon catheter. A Thermablate disposable cartridge is comprised of a slim diameter heat shielded catheter and a soft tipped silicone balloon. Prior to treatment, the cartridge is connected to the TCU in order to heat the sterile fluid contained in the balloon. which conforms to the shape and size of most uterine cavities. Thermal energy is transferred through the balloon, which ablates the endometrial layer of the uterus in two minutes and six seconds. A Thermablate procedure can be performed under local or general anaesthesia with a quick recovery time and no side effects. Proper patient selection is very important to consider. Not all women can undergo a Thermablate treatment. Patients should always be evaluated thoroughly prior to treatment to rule out any underlying causes of their excessive uterine bleeding. It is important to rule out contraindications prior to treating a patient with the Thermablate system. Most importantly, patients should understand that becoming pregnant after a Thermablate procedure is possible but it may be unsafe for both the mother and the fetus. Proper birth control counselling should be provided to patient’s pre and post procedure. Repeat endometrial ablations should not be offered or attempted with Thermablate EAS as the uterine cavity is likely distorted. Thermal balloon ablation offers many benefits over competitive Global Endometrial Ablation systems and is the ideal treatment option for avoiding long-term complications such as De Novo (newly onset) Pelvic Pain. 1. D’Afiero A et al. Efficacy of a Second Generation Thermal Balloon Device in the Treatment of Anemia Induced by Menorrhagia. International Journal of Gynecology & Obstetrics 2012; S261-S530. Obstetrics & Gynecology 2009; 36(4): 256-258. 3. Qaiser A, Chen BF, Powell MC. 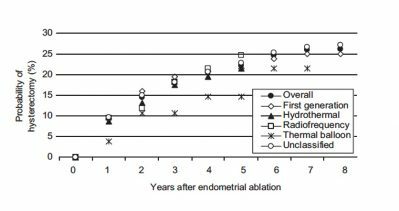 A Long Term Follow up of Results of Women undergoing an Office Based Thermablate Endometrial Ablation for the Treatment of Menorrhagia. Obstet Gynecol Int J 2016, 4(5): 00127. 4. Chapa H, Antonetti A, Sandate J, Bakker K, Silver L. Incidence of de Novo Pelvic Pain After Radiofrequency or Thermal Balloon Global Endometrial Ablation Therapy.